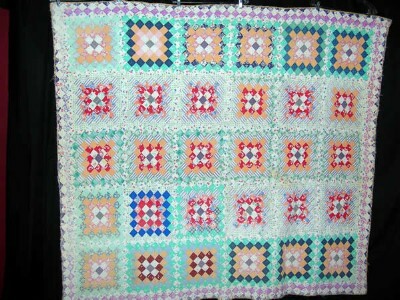 The Consignor of these quilt is very interested in selling and has lowered her prices! Each of these quilts have some condition issues, so please read their descriptions and feel free to contact me with questions. Sept 29-30th - Garden State Quilters at the Westfield Armory in Westfield, NJ. Quilt Show, Door Prizes, Raffle Quilt, Food, and Vendors. Free Parking. Sat 10-5, Sun 10-4. "How do I get a rust stain out?" I may have covered this question before, but think it's important to restate. Rust does not stain, it actually changes the fiber and 'eats' away at the cloth. Superficial rust stains can sometimes be removed by a commercial cleaner like Carbona Rust Remover. But you will be making a change in the fabric. Larger and older areas with rust should just be left as is. Attempting to remove these spots will create holes. So it is important to be diligent and store our fabrics properly. Keep them away from wire hangers, removing all pins and staples, and not storing them in areas or boxes near hinges, etc. I am always looking to expand my horizons, to learn more, and thereby offering more to my customers. Last April I was fortunate to travel to Paducah , KY for the annual AQS Quilt Show. If you ever have the opportunity, and love quilts, it is a MUST! The whole town practically becomes one huge quilt show. Of course there is the convention center with conference room after conference room of quilt exhibits, vendors, workshops and lectures. But then there is the Museum of the American Quilters Society, with more exhibits or quilts both old and new, and more classes. But then you also have the downtown area where you will find quilt and textile related items in antique shops, quilt shops, and even in the windows of the local beauty salon, real estate agent, and tax advisor. You have people on the corners selling quilts. You have the local churches and Rotary organizations holding small shows and events. It was quite inspiring to say the least. But I didn't just go there to see the quilts and spend a lot of money. I went there to learn how to be a Quilt Appraiser. And I am proud to say, I am now a trained professional Quilt Appraiser and am working towards my AQS Certification as a Quilt Appraiser. 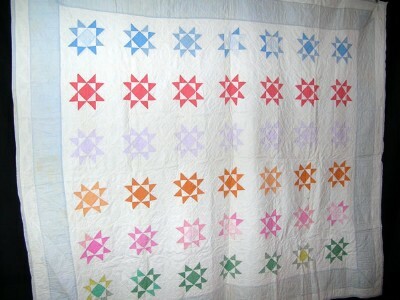 I am now able to appraise new quilts and old quilts. 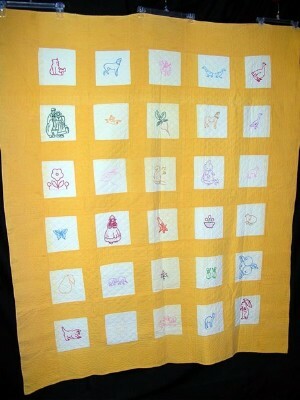 There is more to the process than just being able to date a quilt, and being experienced enough to place a value on it. For my customers this will be good news and bad news. The good news, that this service is now available to you by appointment, if you are local enough for me to visit you. If not, I am able to recommend someone who is local to you. The bad news, I am no longer able to provide free valuations online with just photos. Why would you want your quilt appraised? If you are in the NY/NJ/PA area, please contact me for an appointment! Don't forget to check our What's New Page. You'll find Quilts and Tops, Handkerchiefs, Shoe Clips, Pillowcase, Lingerie Bags, Tablecloths, Napkins, Dresser Scarves, Doilies, Towels and more!